Halloween is here, and that means apple bobbing, pumpkin carving, scaring the neighbors and lots of free candy! Sarah wants to go out and party with her friends, but her parents have ordered her to take her bratty little brother out trick-or-treating, instead. What a chore! Can you help Sarah keep her brother entertained while doing some trick-or-treating of her own? 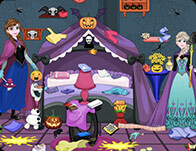 Hurry up and complete the activities within the time limit to earn points and help Sarah have fun on Halloween night in this great online slacking game for girls!